To be quite honest here, this bag was a bit of a fluke. I was making something else. 8 ply yarn, any yarn will do. Amount of yarn will be less than 100 gms. 2. 1sc, 3dc in first sc, skip next 3 sc, *1sc, 3 dc in next sc, skip next 3 sc*, repeat from * to *, to last 4 sc, skip next 3 sc, 1sc in last sc, ch 1 turn. 3. 1sc, 3dc in first sc, skip next 3 dc, *1 sc, 3dc in next sc, skip next 3 dc*, repeat from * to * to last 4 sts, skip next 3dc, sc in last sc, ch 1 turn. Repeat row 3, 7 more times. 11 and 12. sl st across next 4 st, continue pattern as above, to end, ch 1 turn. 13. repeat row 3, 7 more times, fasten off. Work as for back piece to row 10. To give the front piece a tighter edge, I did a row of rsc, (crab st) along the top. 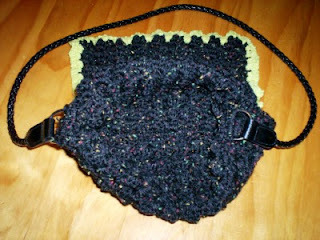 With bag inside out, sew front piece to back piece beginning at side along the bottom and up to the opposite side. To decorate the flap, I did groups of 3 hdc, evenly around the flap. 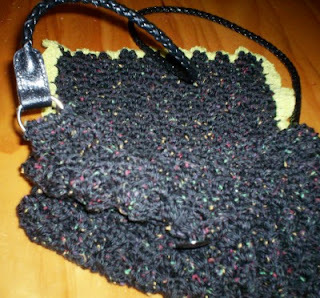 Find a nice button or make a bobble to close the flap, you will find the pattern has efficient gaps to go over a button. To make a bobble, ch 3, 12 dc in 3rd ch from hook, sl st to finish, cut yarn leaving a long tail, thread tail through all stitches and pull tight. You can also make a smaller bobble by using sc, starting with 2 ch. I took a strap from an old bag and sewed it to the inside of the bag after I had done a row of sc on the steel loop. This makes a sturdier attachment. 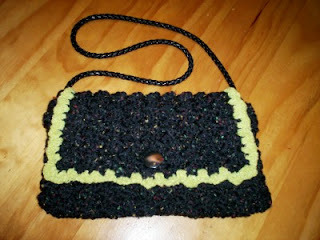 I may line the bag, using the method in this on line tutorial. Have fun, this makes up very quickly.